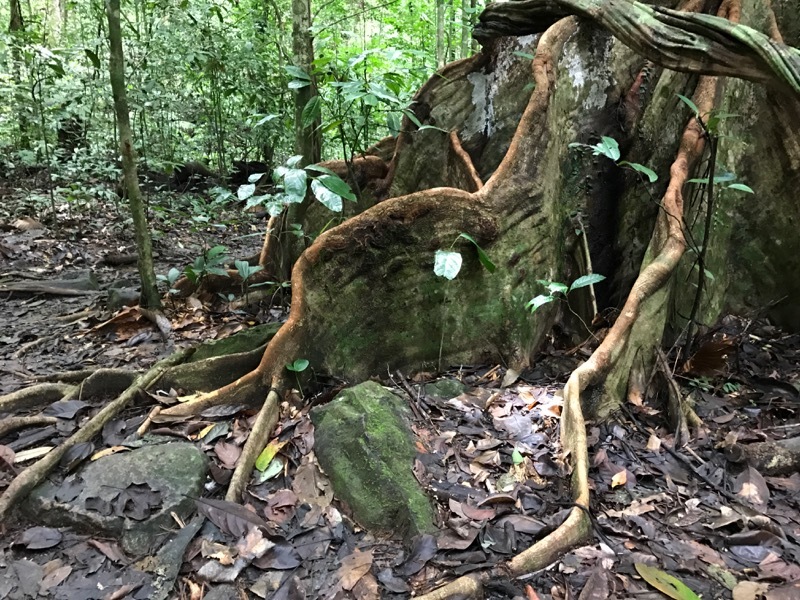 This is part 5 of a 7-part account of my trip to Peninsular Malaysia and Borneo in January/February, 2017. 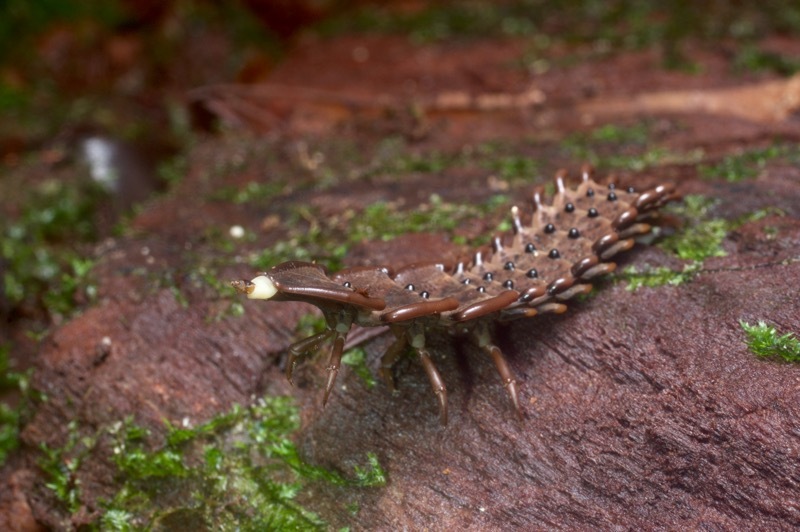 Part 4 featured spiders, two Megophrys nasuta near misses, and a not-terrifying slug snake! I flew from Kuala Lumpur International Airport to Kuching, Sarawak, in Borneo (Borneo!). A few weeks later KLIA would become famous as the site of the strange assassination of the North Korean leader's brother, but nobody was assassinated while I was there, to my knowledge. I probably wouldn't have noticed since I was so excited to visit Borneo. I had planned my itinerary for the Kuching area with much assistance from Hans Breuer. 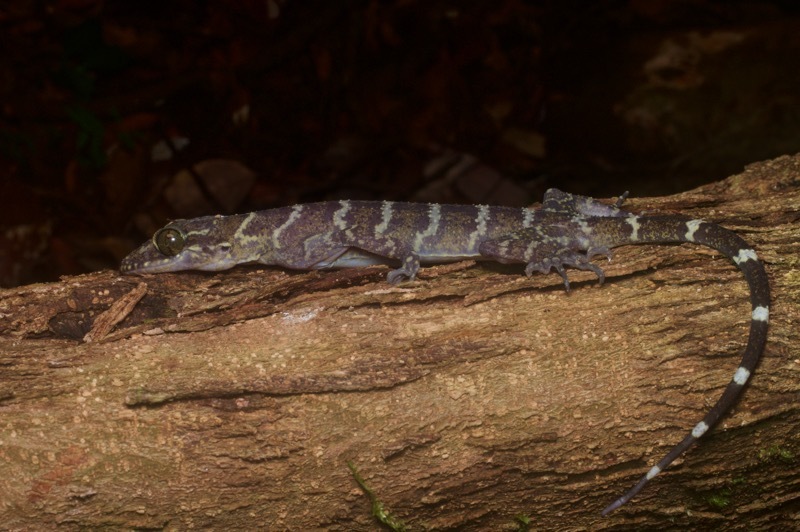 We had intended to meet up a few times while I was in the general neighborhood, but unfortunately this was scuttled by a Breuer family emergency, so all of my Borneo herping ended up being solo. One simply cannot visit Kuching without spending at least one night at Kubah National Park, "Home of Palms and Frogs". I stayed for two nights, in one of the hostel rooms. I shared the hostel the first night with a Mike and his girlfriend, and also with a Luke. I didn't get an opportunity to talk to Mike and friend, but it turned out that Luke was in fact there to see the palms; he is a palm enthusiast. I did not know that this was an actual category of people, but I suppose the palm enthusiasts might not all be aware of the herp enthusiasts either. I arrived in late morning and, after depositing my bags in the hostel, headed straight up to the world-famous Kubah frog pond. And I do mean "straight up". 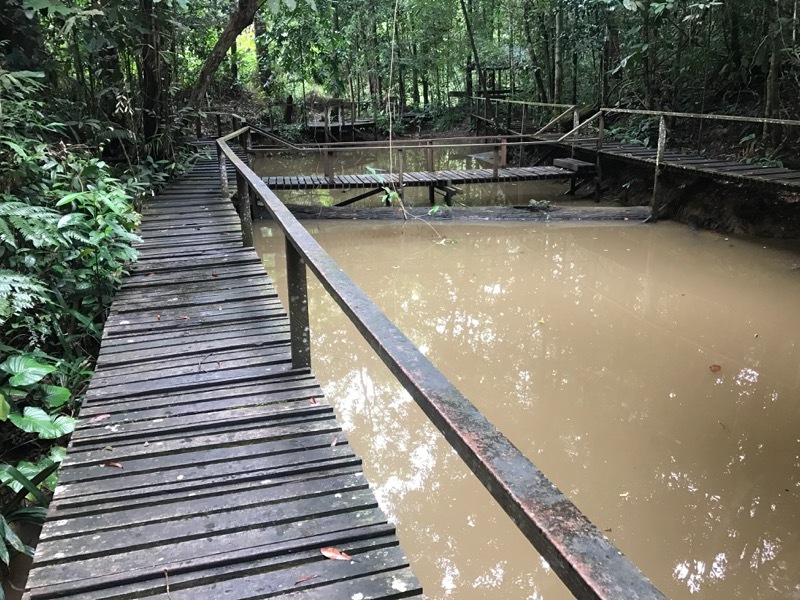 One trail at Kubah (the Belian trail) is supposedly easy walking, but that one didn't sound very herp-enriched from what I could determine. All the other trails, including the one paved road, go sharply up or sharply down or both in turns. I'm sure the existence of this National Park was based on this inconvenience; all of the relatively flat land in the area was occupied long ago. I did not expect to see many frogs at this hour, and my expectations were met and even surpassed, as I did not see any at all. By day the pond looks like the big muddy pig wallow that it is, surrounded and bisected by slippery boardwalks. 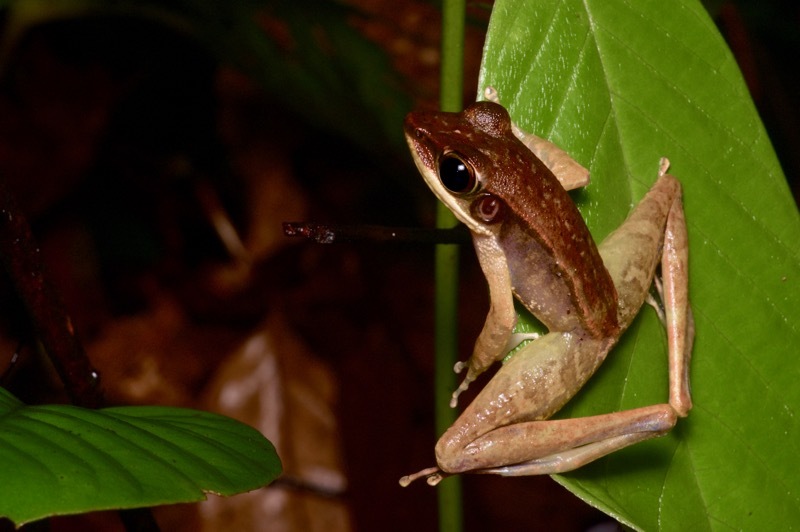 I knew that nearby lurked the pitcher plant Nepenthes ampullaria that housed tadpoles and breeding adults of the teeny-tiny frog that was famous for a while as Microhyla nepenthicola but eventually clarified as Microhyla borneensis. I wanted to find these frogs at night so I scoped out the location of the pitcher plants by day. I spent the next several hours hiking up and down various trails. It drizzled on and off and not much was happening fauna-wise. Flora-wise, there were a lot of palms (which perhaps to Luke's dismay I generally ignored) and some fine rainforest trees. Down near the waterfall a couple of Black-spotted Rock Skippers proudly perched on boulders (until I got near, that is). These frogs signal each other from afar with dramatic hand gestures, but the ones I saw just kept their hands to themselves and gave me dirty looks. The only other herps to put in an appearance during that first day were a few skinks that scuttled around in the leaf litter. 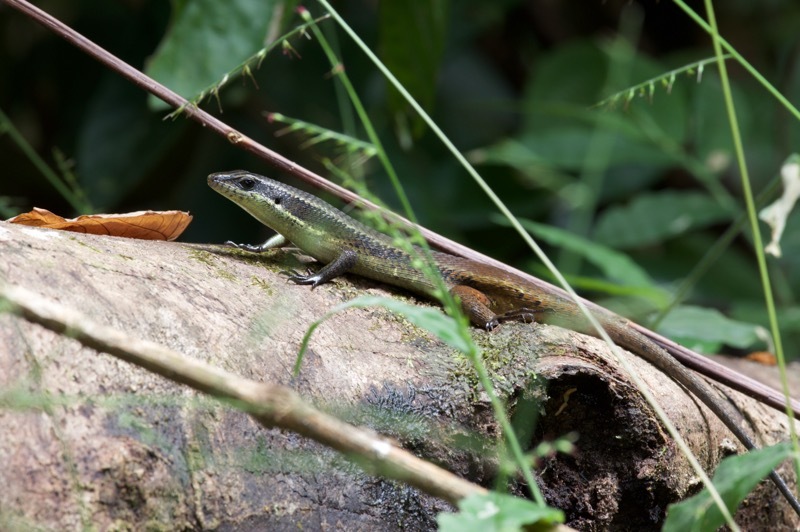 I believe this is a Brown Mabuya (Eutropis rudis) from a few details of pattern and scalation, but it might be the more widespread Eutropis multifasciata. My second day in Kubah was even less productive. It rained so steadily that I basically stayed in the hostel all day, resting up for the real action at night. As a warm-up for that real action, here are just a few of the many phasmids I found at Kubah. 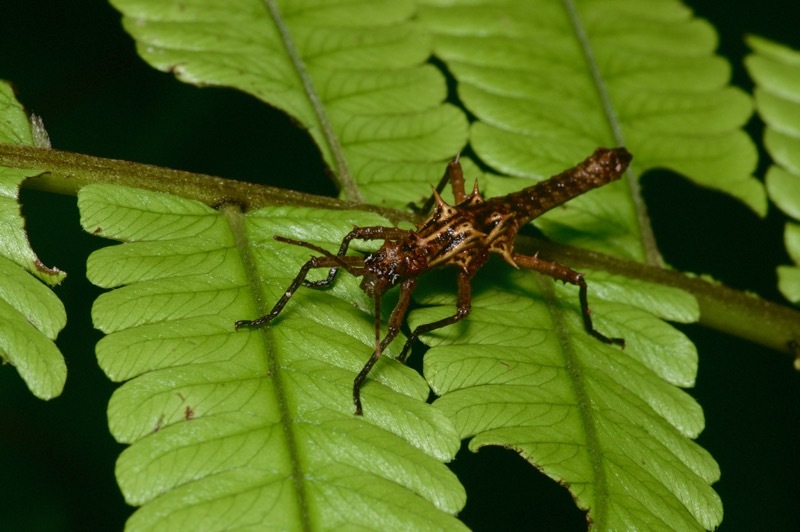 Big thanks to Albert Kang on JungleDragon and Ulises L&oacute;pez Mora on iNaturalist for help with the phasmid IDs. 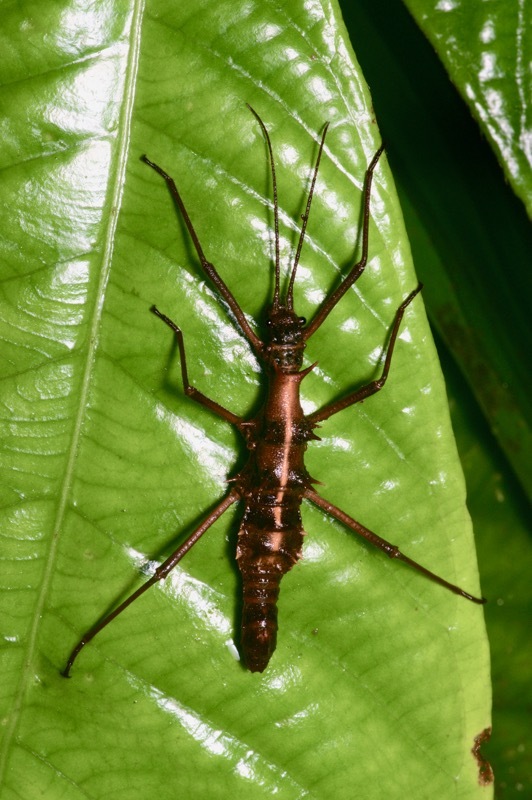 I saw one insect even weirder than the phasmids. I naturally assumed that it was a space alien, but when I sent the photo to Kurt "Orion Mystery" G, he pointed out that I had already seen this genus in Peninsular Malaysia, though this one was a different species in that genus. Not being a bird guy, I basically ignored the few birds I saw during the day. 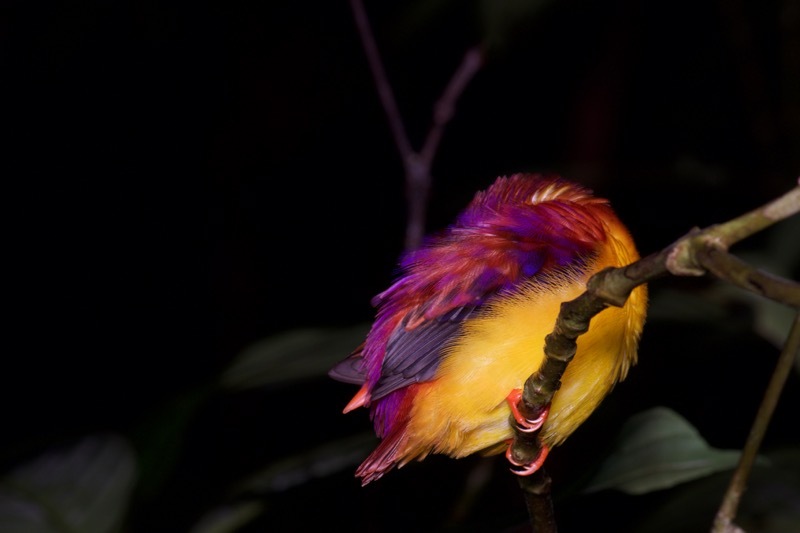 But I could not ignore this little bird sleeping at night. As everyone who is not a palm enthusiast knows, the real stars of Kubah are the frogs. 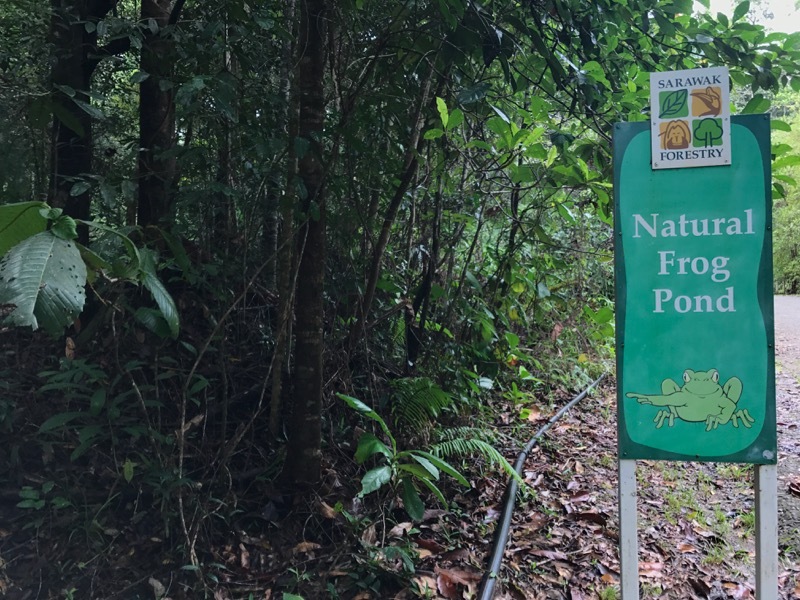 The aforepictured Frog Pond is a great place to find various pond-breeding species, and everywhere else in Kubah is a great place to find all sorts of other species. Let's first see who was hanging out around the pond. 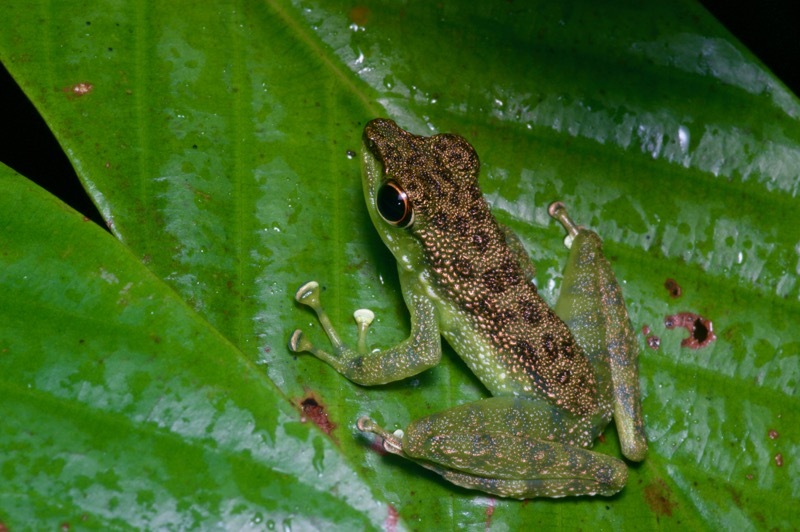 Harlequin Flying Frogs were the most common species, and probably outnumbered all other species combined. They all sported the same basic pastel brown/orange/tan background color and the same red webbing, but their dorsal patterns varied from spotty to blotchy to stripey. 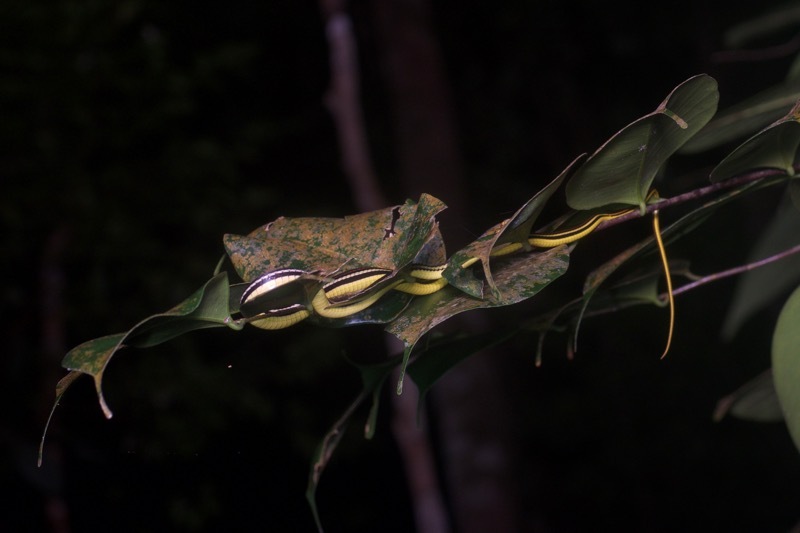 A couple of other Flying Frog species, including Wallace's Flying Frog, might be found at the pond on any given evening, but these were the only Rhacophorus I saw there. I guessed that this cute li'l metamorph was also a Harlequin Flying Frog. 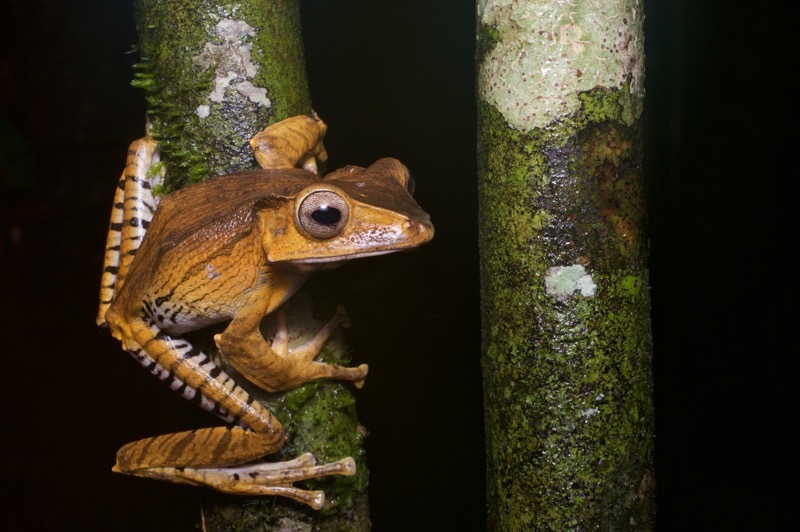 Thanks to Borneo frog expert Alexander Haas for confirming my guess, as well as for providing ID help on several other frog species. Another common species at the pond was the spectacular File-eared Treefrog. They are large, they are dramatically patterned, and they have weird looking heads. 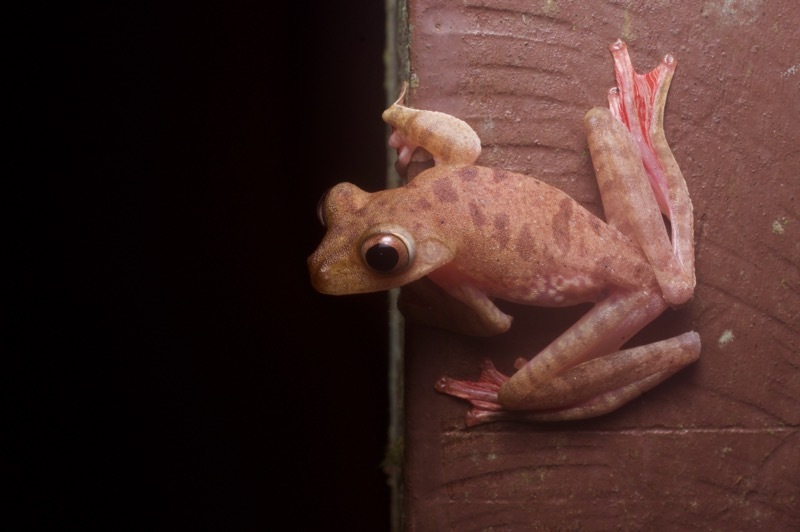 Also, they are masters of the large treefrog "I'm about to jump far away from you" pose. You gotta love 'em. 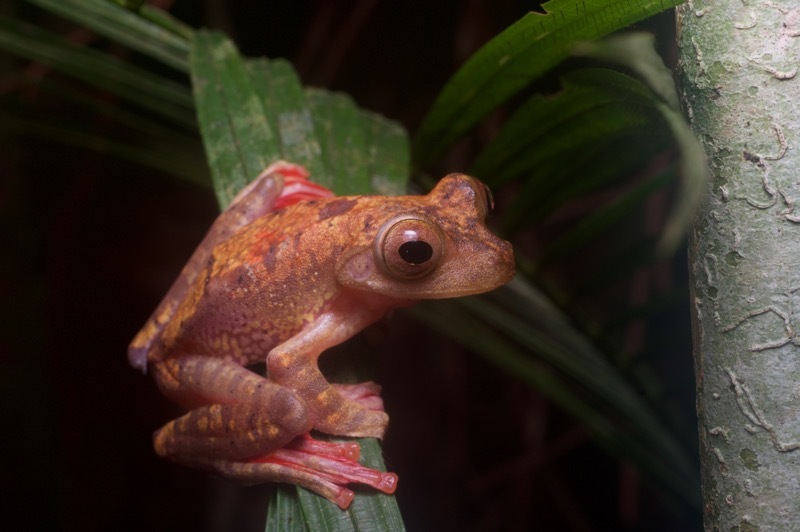 Dark-eared Treefrogs couldn't compete in amazingness with either flying frogs or the bizarre-looking File-eared Treefrogs, but they are still perfectly fine medium-sized treefrogs. Don't you be dissin' them. 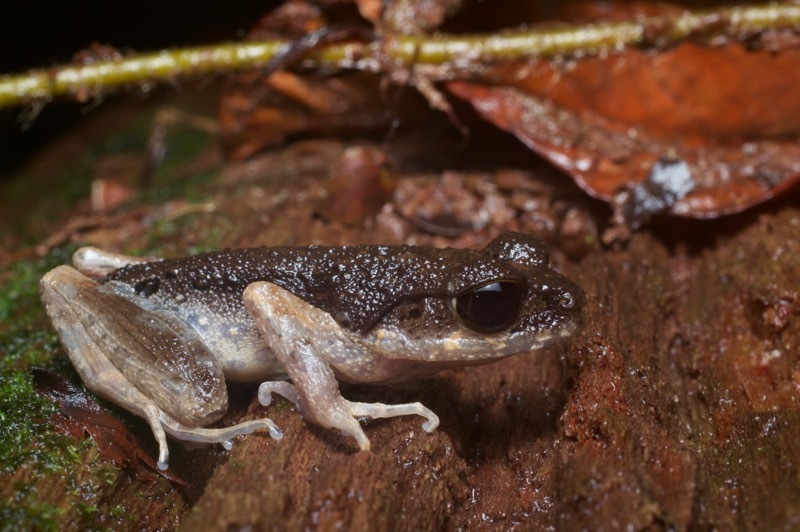 Something like 80% of the frog species in Borneo are endemic to that island. 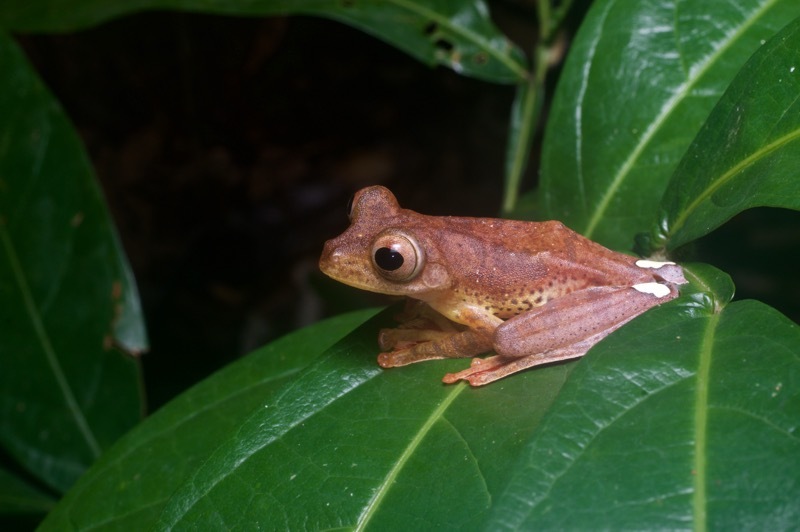 One of the non-endemic species, which I had seen earlier on my trip in Peninsular Malaysia, was the Four-lined Treefrog. I saw a few of these around the pond, including this amorous gentlefrog. 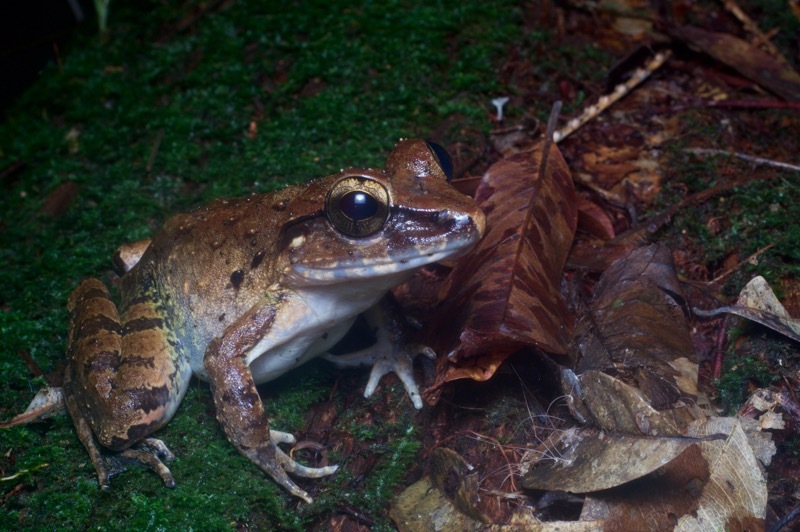 The Copper-cheeked Frog helped out with Borneo's endemic frog percentage by being split from what was formerly considered the widespread species Rana chalconata. Note that this one is sitting on the boardwalk's handrail, a popular location for all of the local arboreal species. Around the pond edges many large frogs lay in wait. I believe they were all Giant River Frogs, but I'm not overly confident since Limnonectes is a confusing genus. This cute little guy was hiding in the nearby leaf litter but gave itself away with a hop. 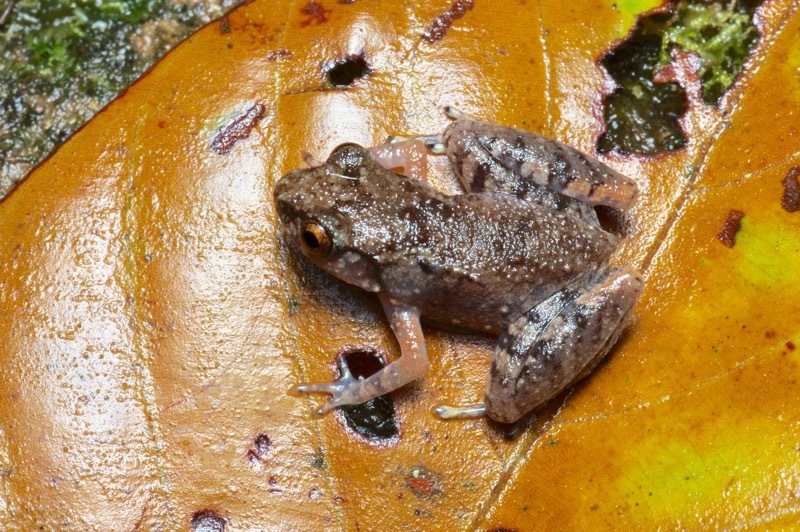 The microhylid frogs in the genus Kalophrynus are called "sticky frogs" due to a glutinous white substance that they secrete from their skin when disturbed. I spotted this dark Kalophrynus right around dusk. I couldn't figure out what species it might be from various references, so I asked Alexander Haas for help. He confirmed that it was Kalophrynus, but said that the current systematics/taxonomy of this genus is a mess and the common keys don't work. 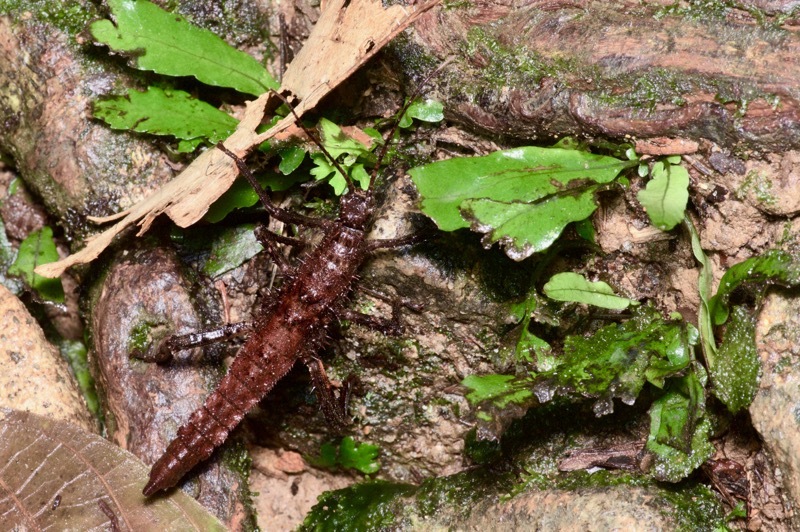 So it will have to be just Kalophrynus sp. for now. 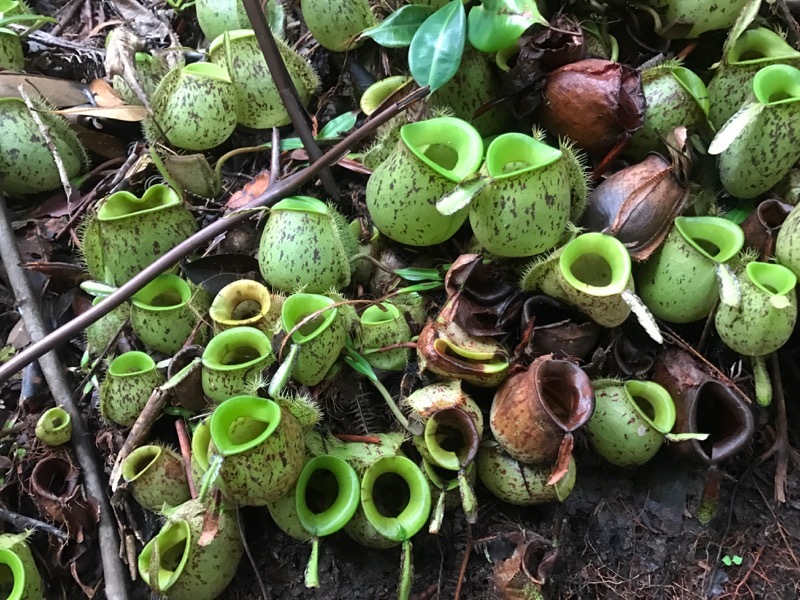 When I returned at night to the pitcher plants that I had staked out in the afternoon, I found the inhabitants I had been hoping for. I also saw some of the world's tiniest tadpoles in these pitcher plants, but didn't get a photo worth sharing. 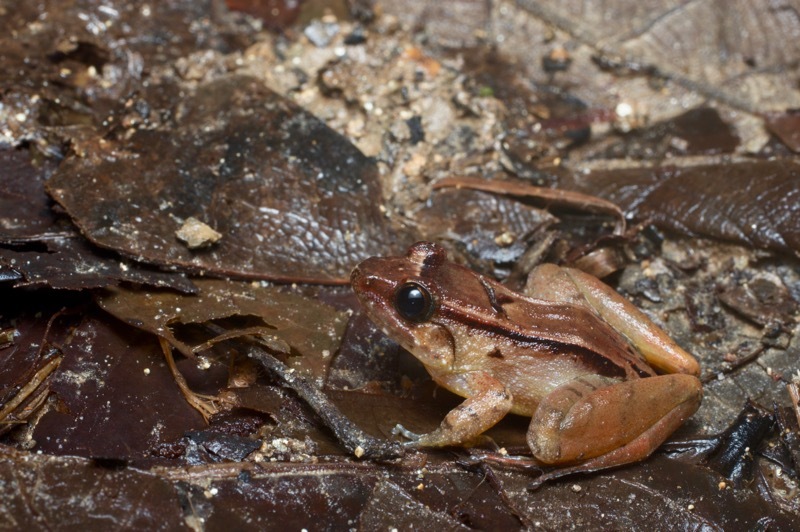 Frogs were unsurprisingly easiest to find near permanent water, but some could turn up anywhere in the forest. The only more-or-less standard toad I saw was this young Forest Toad in the leaf litter. 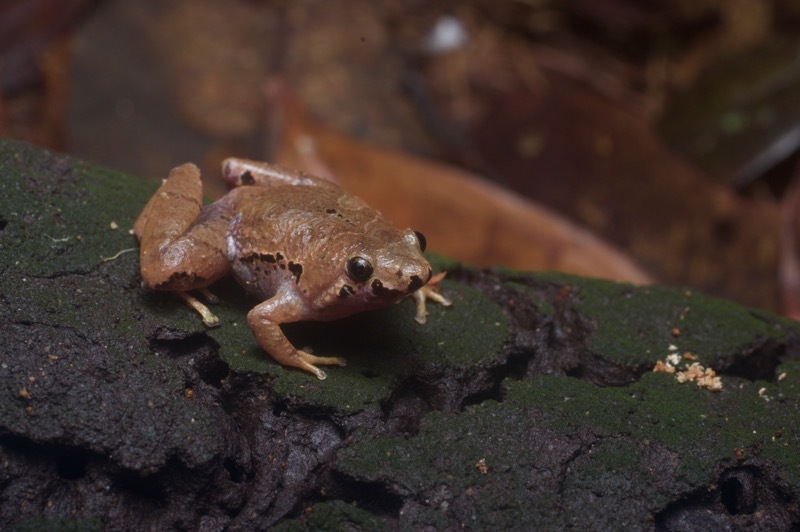 The Lowland Litter Frog was another leaf litter species (surprise!). 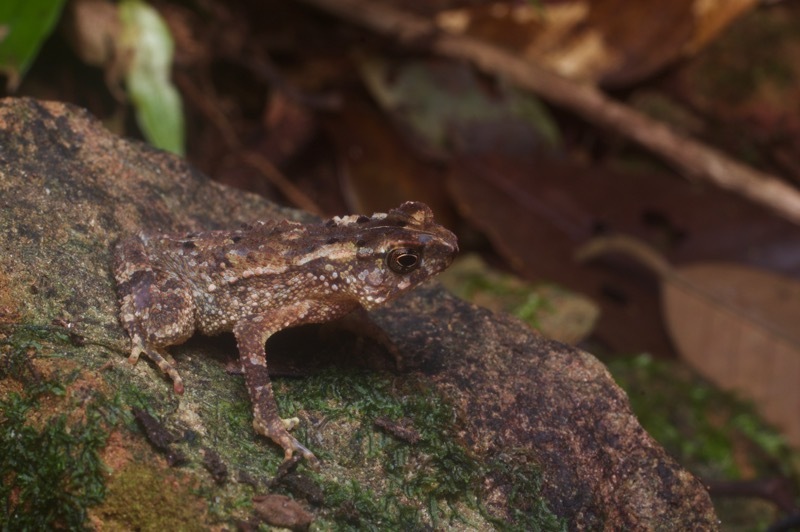 They have basically the same goofy proportions as the Leptobrachium hendricksoni I had seen in Peninsular Malaysia, but lacked the spots of that species. 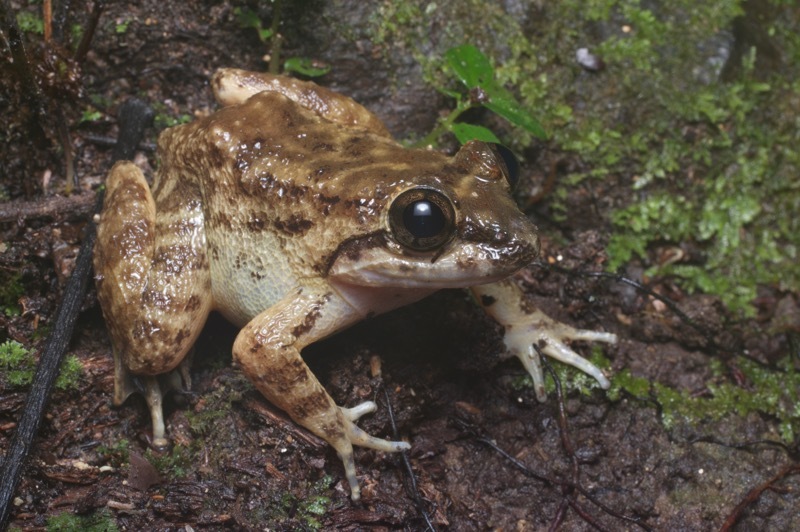 When I saw this next frog, I first thought it must be another Leptobrachium due to its short skinny legs and biggish head. But its legs weren't quite short and skinny enough, and its head wasn't quite big enough, so I quickly doubted my own snap conclusion. It turned out to be a species in a different genus but in the same family, so I wasn't too far off. Although many Limnonectes species are hard to tell apart, there are a few species that are easy to identify, like this Smooth Guardian Frog. 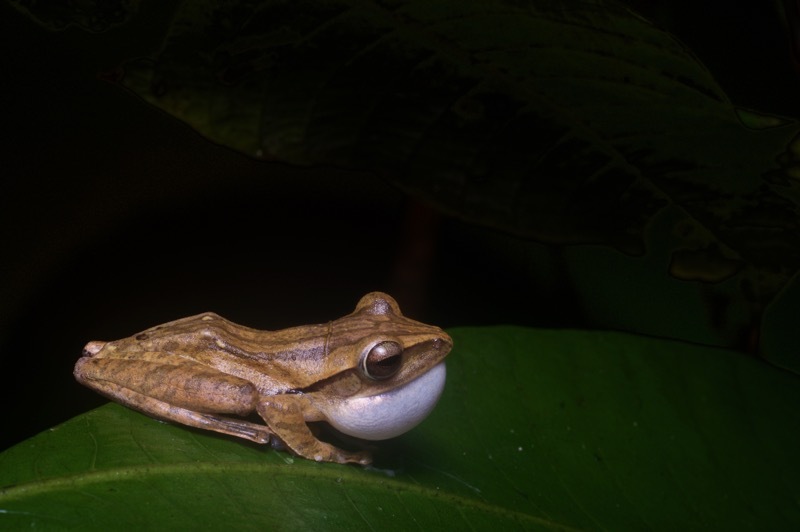 They're called Guardian Frogs because the male stands guard over the eggs, which are laid on the ground. 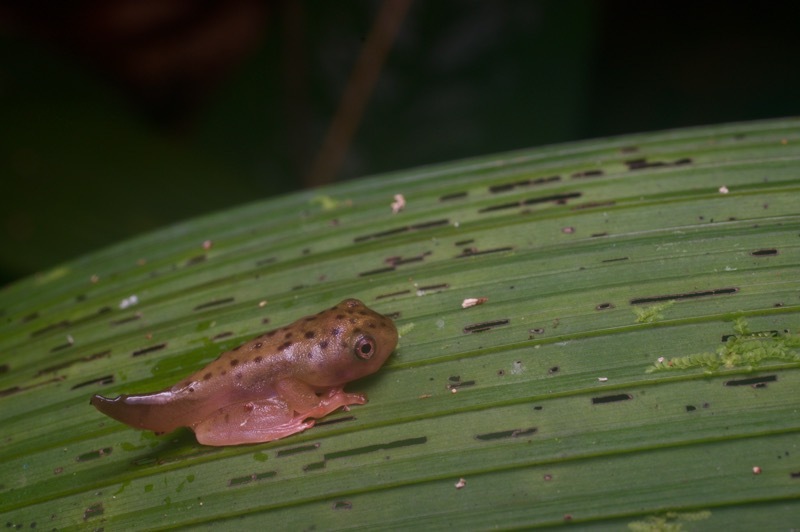 When the eggs hatch, the male carries the tadpoles on his back to some nearby water and releases them there. This is one of the more typical, problematic Limnonectes frogs. It would have been called Limnonectes conspicillatus until a few years ago, when the researchers realized that they were just as confused as us laypeople. Now it is considered part of the Limnonectes kuhlii complex. In other words, it was once part of a clearly but incorrectly defined species, and now it is part of an amorphous blob of related species that even the experts have stopped pretending to tell apart. 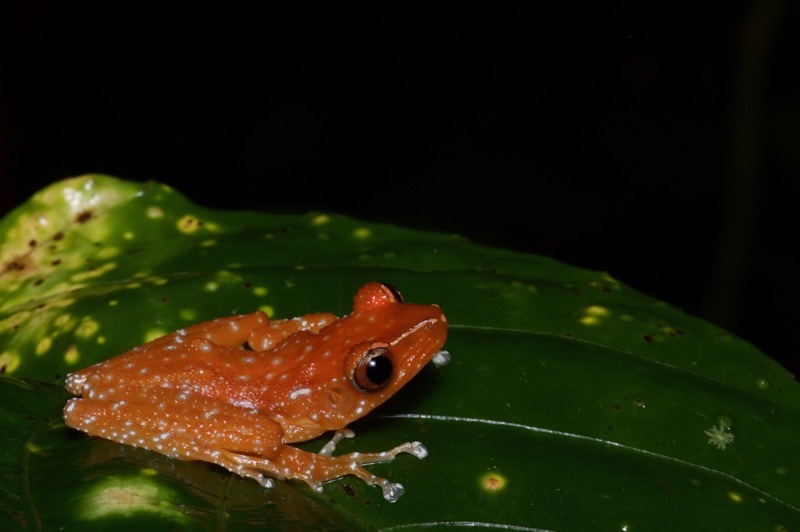 Other than the Four-lined Treefrog, the only other frog I saw at Kubah that I had already seen in Peninsular Malaysia was the always-welcome Cinnamon Frog, which adorned a leaf close to the ground in the middle of the forest. Perhaps it will be split into its own Borneo-endemic species soon. One can always hope. I made my way back down to the waterfall area at night, thinking that it should have a different set of frogs than the pond or the forest trails. This gave me an opportunity to get a lot closer to the Black-spotted Rock Skippers that were evasive during the day. At night I saw several sleeping on leaves, rather than on their daytime boulder perches. 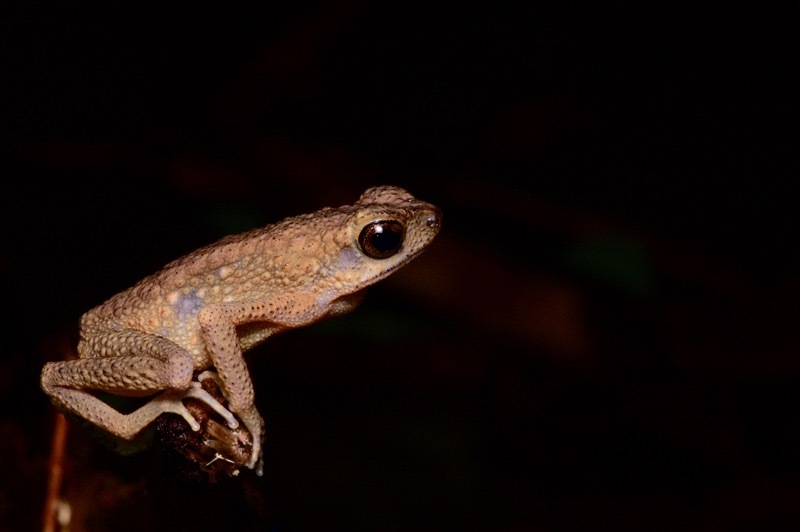 Also near the waterfall I saw my first slender toad, this one a Brown Slender Toad (confirmed by Alexander Haas). 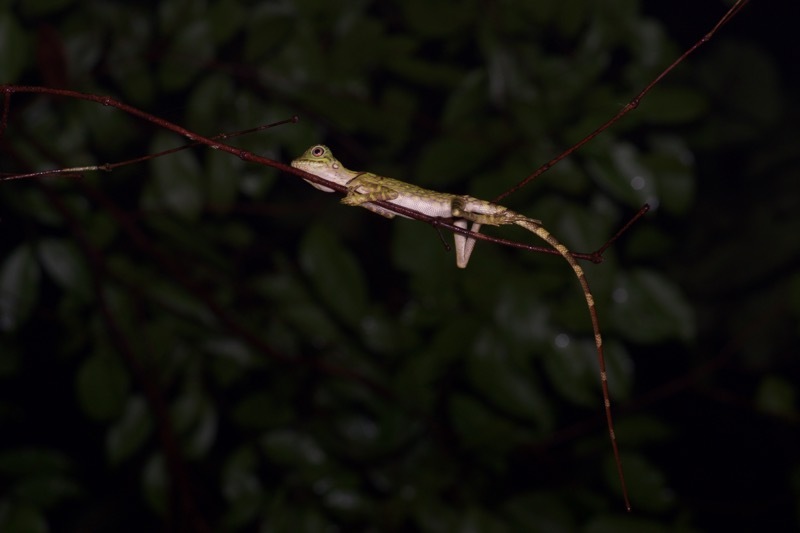 It was perched on a twig near the river, which is the typical calling position for the males. So I'm guessing it was a male, but I have no other evidence. Nearby I found a couple of much smaller slender toads, perhaps an inch long. 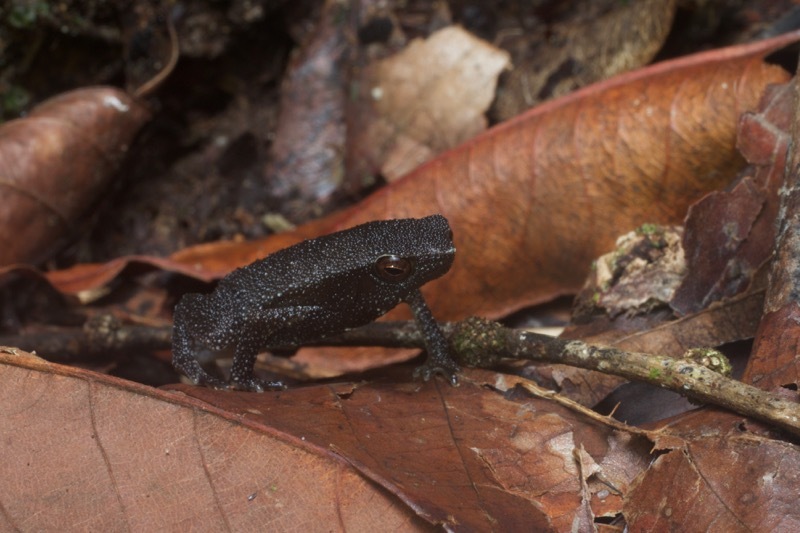 I am pretty sure this is the aptly named Dwarf Slender Toad. And shortly after that I saw an even smaller frog with somewhat similar proportions. This one was perhaps 2/3 of an inch long. 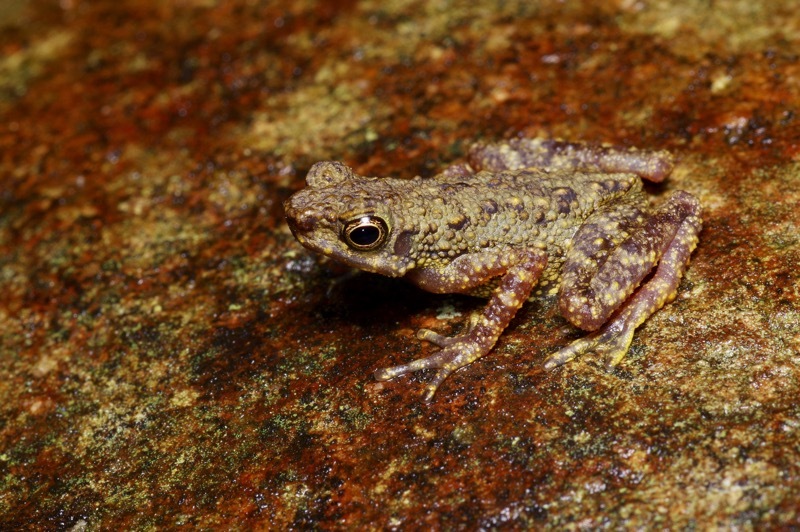 Another oddly proportioned anuran that was hanging out near the waterfall was this Western Torrent Frog. Frog or grasshopper? You be the judge. 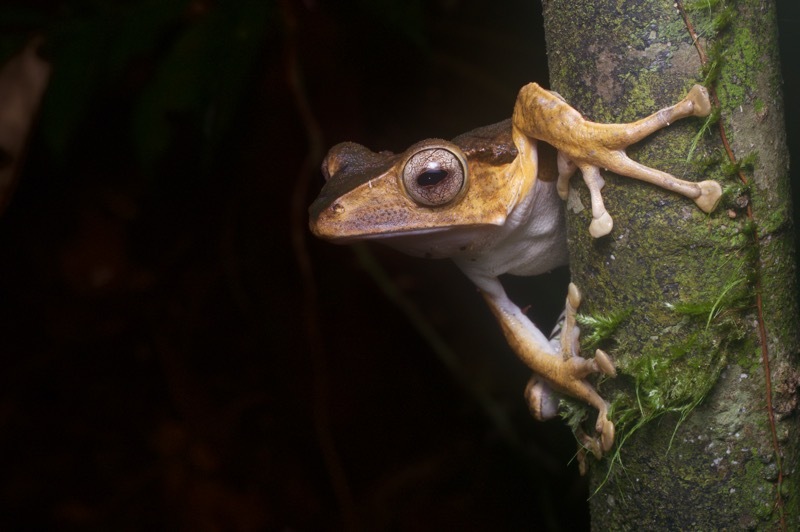 Malaysia has something like 200 species of frogs. Of these, there were two that I really hoped to see on my first trip to this country. 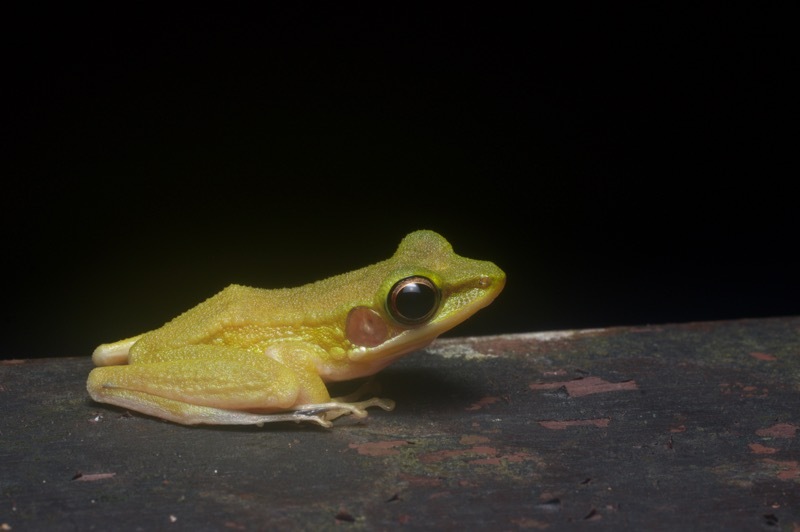 On my first night in Malaysia, my first goal was reached when Kurt found not one but two Wallace's Flying Frogs for me. 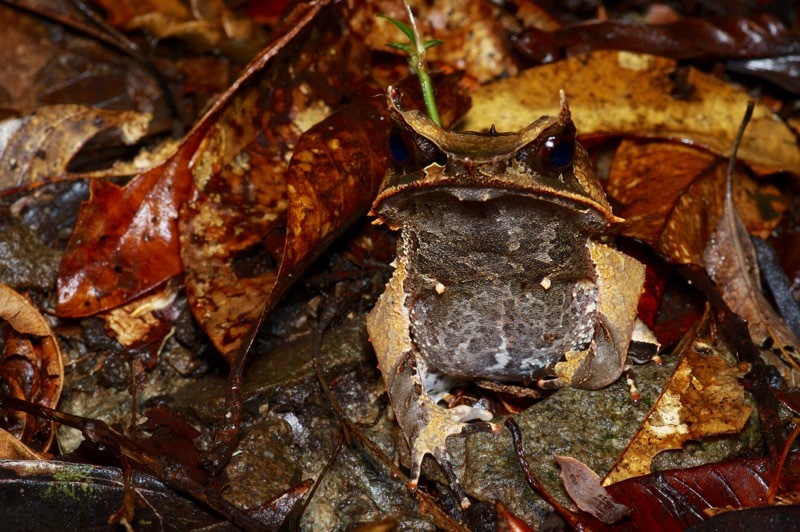 But we failed to find the second target, the world-famous Long-nosed Horned Frog aka Malayan Horned Frog aka Borneo Horned Frog aka Asian Horned Frog aka yada yada yada. 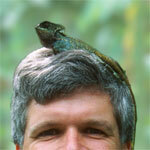 Now I was on my own in Borneo, without Kurt's vast experience and sharp eyes to help me out. 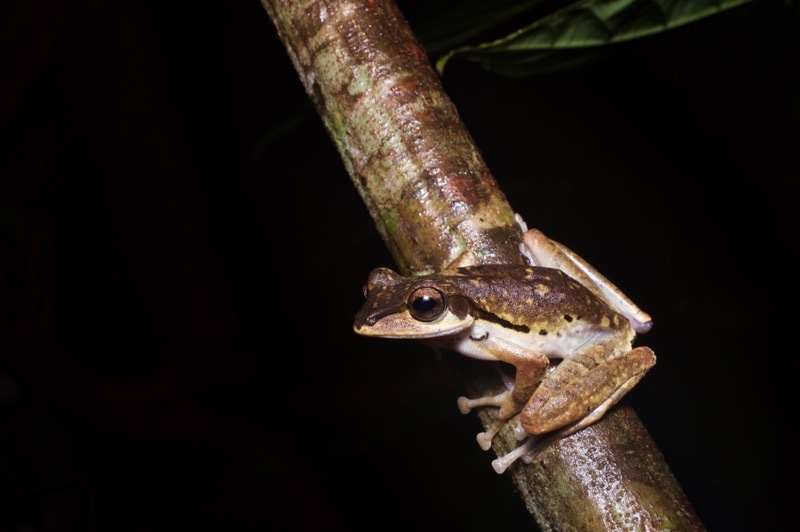 But I had gotten many chances to see him in action in Peninsular Malaysia, finding frogs of similar size and lifestyle, and I had picked up the basic tricks of the trade. 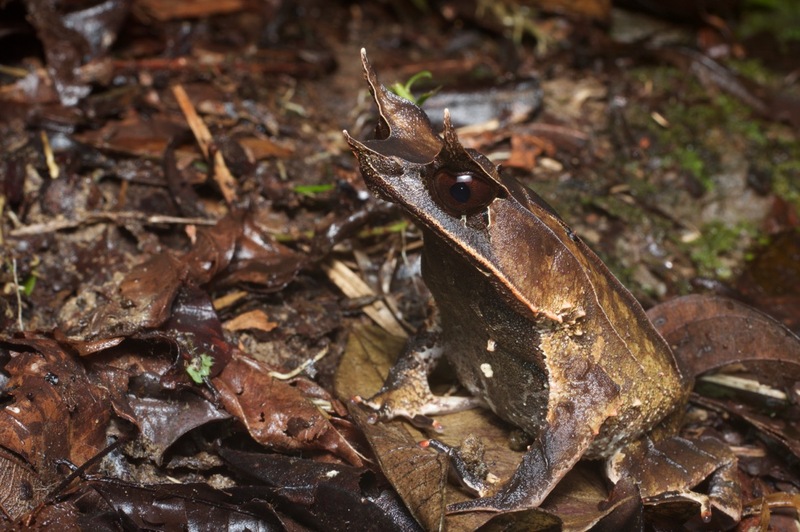 I knew these Long-nosed Horned Frogs to be reasonably common at Kubah, and armed with my newfound experience I had a pretty good idea where and when and how to go looking for them. This paid off early in my second night at Kubah, when following some eyeshine led me to this ridiculously camouflaged and grumpy-looking fellow. After I took a bunch of photos from different angles, the frog finally acknowledged my presence by lowering its head and hunkering down, without actually moving. Why bother moving when you can hide yourself like this? Several hours later I was in the same general area and I thought I'd see if I could find another of these fantastic frogs. It didn't take long before I spotted this one, close to where I had seen the first one. When I was back at my room later on, I looked at my photos more closely and realized that my second Long-nosed Horned Frog was in fact also my first Long-nosed Horned Frog. 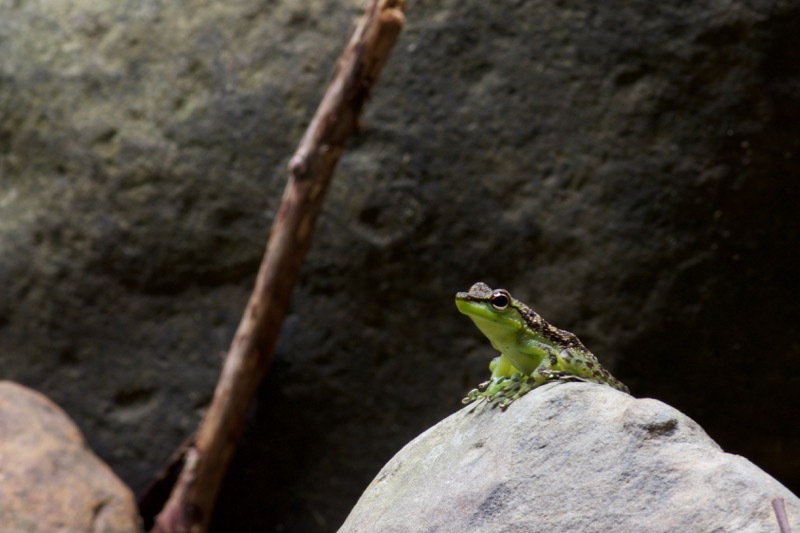 It had moved a small distance, maybe a foot or two, but the details of patterning and tubercles and such clearly revealed that only one frog had been involved in the whole affair. 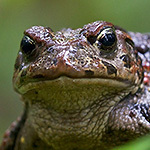 Perhaps after showing off my one and only Long-nosed Horned Frog I should just stop, because what could top that? 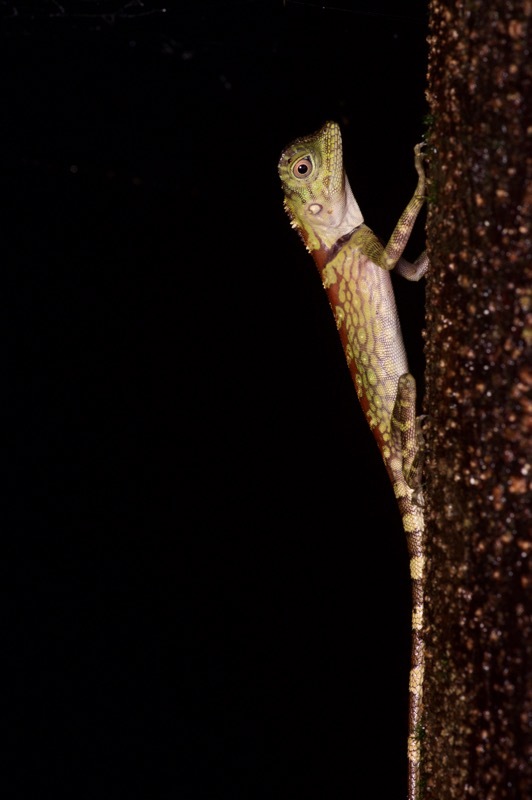 But just in the interest of completeness I will mention the reptiles that I saw at night amongst all the frogs. Skinny little Kendall's Rock Geckos hugged various boulders and buttresses. They were an interesting photographic challenge, because they could and would dash off in an instant when startled, but if I approached slowly and steadily enough they would allow me to get very close. 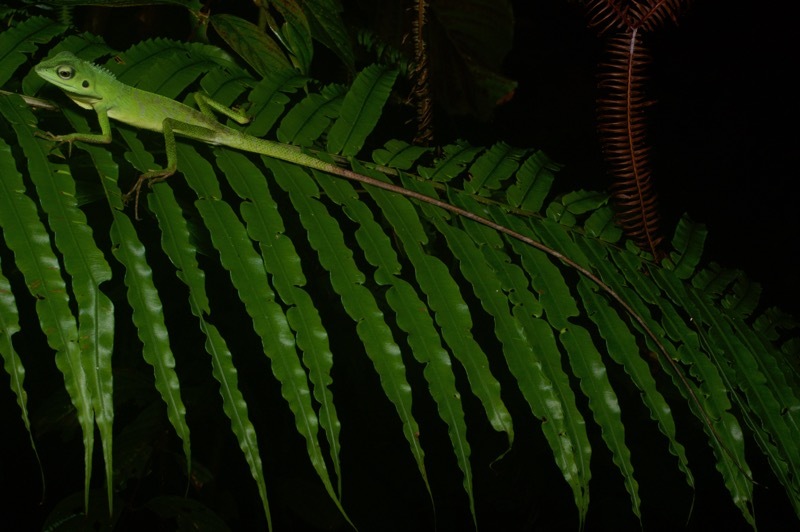 The much larger and nearly as common Peters's Bent-toed Geckos were slower, but also generally didn't allow as close of an approach. I confess that I caught this one and placed it on this log. And yet I only got this totally mediocre photo. I'm just not very good at posing herps for photos. This photo is also only mediocre, but at least it isn't posed. What a tail! My favorite lizard from Peninsular Malaysia put in an appearance at Kubah, but only in the form of a baby. Cool-looking to be sure, but nothing like the crazy adult males. When I saw this little sleeping agama from below, I was pretty sure it was a species I hadn't already seen. But I couldn't tell which species from this angle, so I used my cheapo extendible snake hook to pull down the branch it was dangling from, and then placed it on a tree trunk. 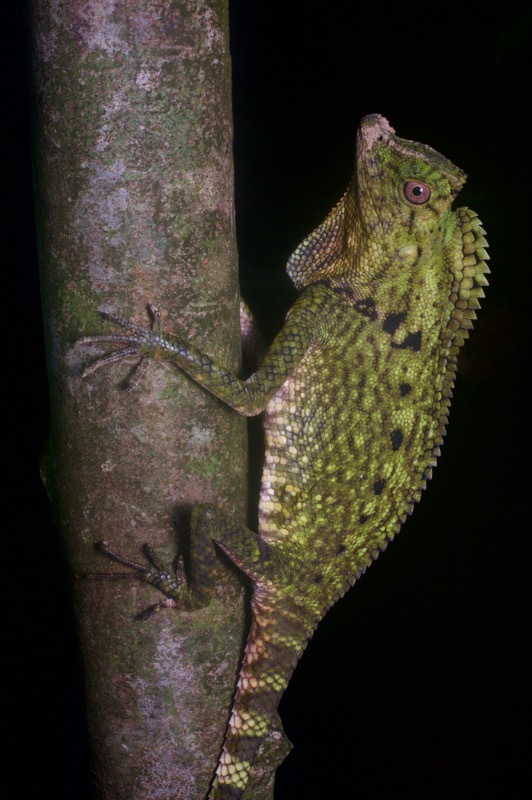 From this new angle I could see enough detail to identify it later on as a young Bornean Angle-headed Lizard. 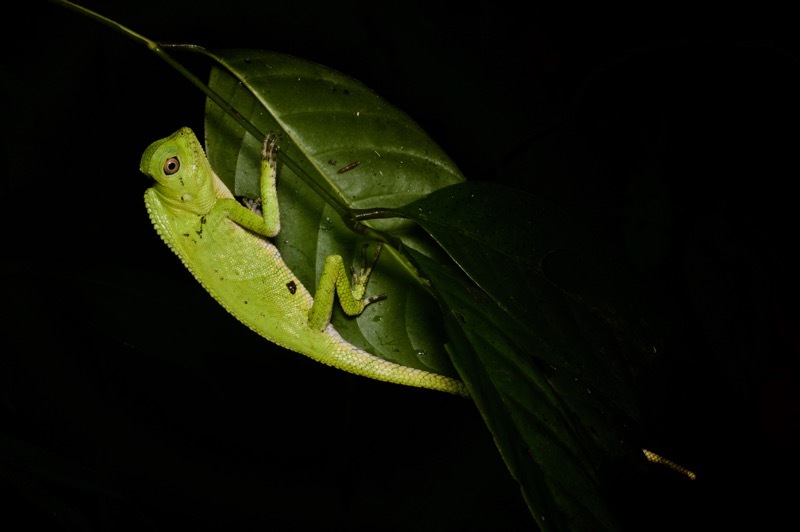 On my first night in Kubah, at one point I glanced up and saw a bright green lizard on a relatively small tree. I love me a big colorful lizard. Bonus points for being arboreal, for being crested, and for having a silly head shape. 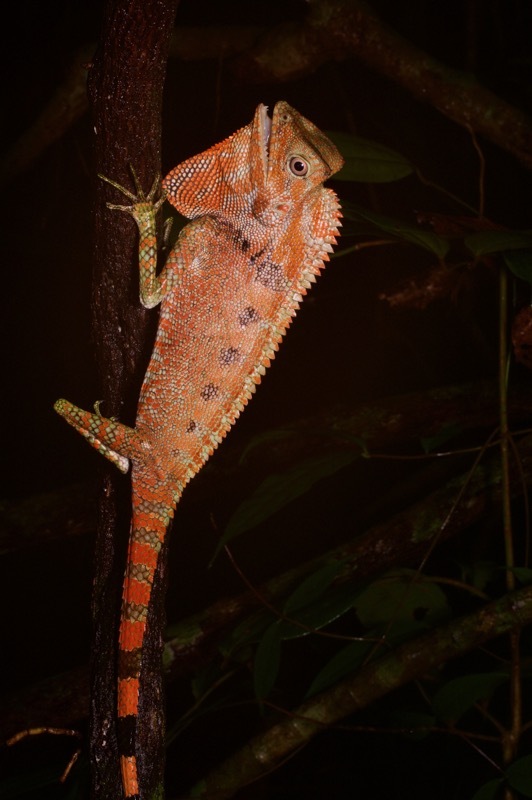 On my second night in Kubah, at one point I glanced up and saw a bright orange lizard on a relatively small tree. Whaaaaa? Bright orange lizard?!? This is the same species! Apparently they can quickly change from bright green to bright red/orange, though the ones I saw did not exhibit any color-changing tendencies. I gotta say, this bright orange look makes for terrible camouflage, at least to the human eye. It stood out like a flare. I also saw one cute little baby of the same species, crest and silly head shape already firmly in place. 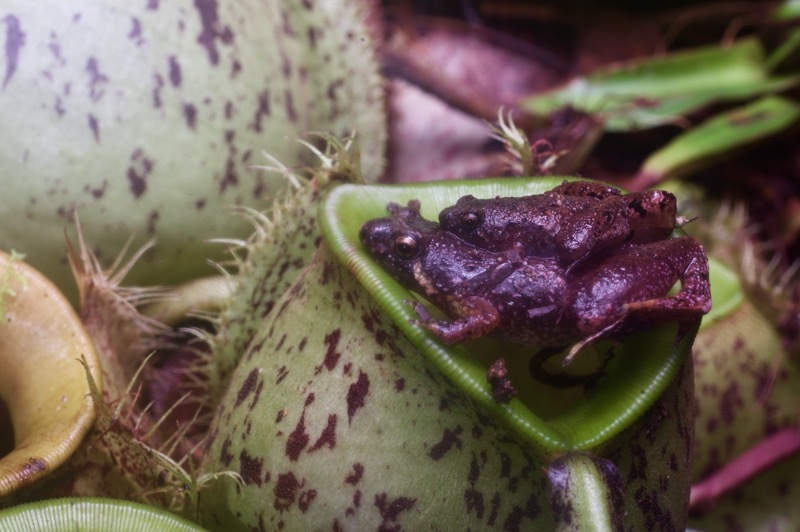 Remember those little microhylid frogs that breed in the pitcher plants? While I was kneeling on the ground photographing them, something fell from above and landed squirmily just inches in front of me. I immediately recognized it as one of the most recognizable snakes in the area, and placed it on a nearby branch for some photos. It chose this pose by itself. This small snake was resting as pictured about eight feet up in the trailside vegetation. After getting this photo, I used my snake hook to start to lower the branch down towards me. The snake would have none of this tomfoolery, and very quickly dropped to the ground and shot off. I lost it almost immediately in the loose roots and leaf litter. I had recognized it as a Dendrelaphis but wasn't sure which species, at the time. 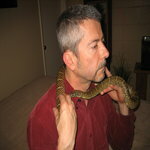 When I looked at this photo later I recognized the tell-tale striping of Dendrelaphis caudolineatus. The only other snake I saw at Kubah was a long skinny green one slithering across the trail. I recognized it as a Boiga, but didn't know the species. 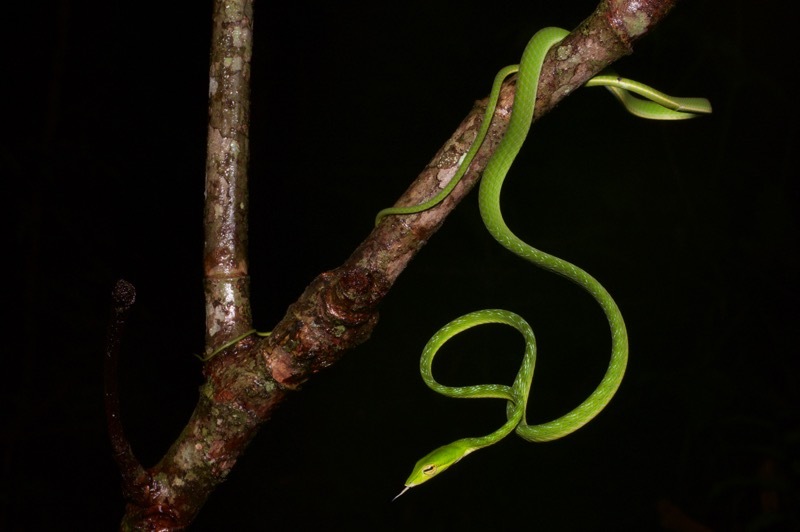 The only other Boiga I had seen was on my first night in Malaysia, and the colors of that one were completely different. 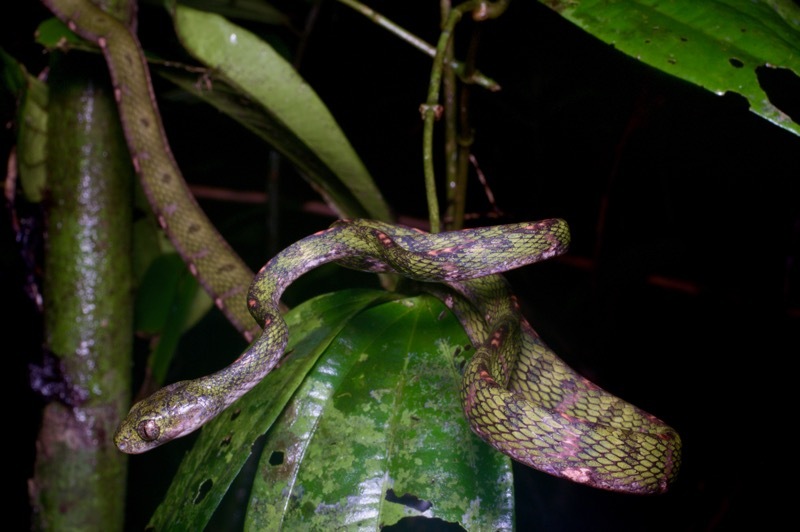 And yet, it turned out to be a different color form of that same species after all, the White-spotted Cat Snake. I encouraged it to climb some nearby vegetation for better photos. It was happy to do so, but not happy to stop moving. I tried for some time to get it to hold a decent pose for a photo, but I ran out of patience before the snake did. After my two nights in Kubah, I had the Kubah people call a taxi to take me back to Kuching. While waiting for the taxi to arrive, I spotted a lizard that had apparently gotten into mom's makeup kit while she was away. 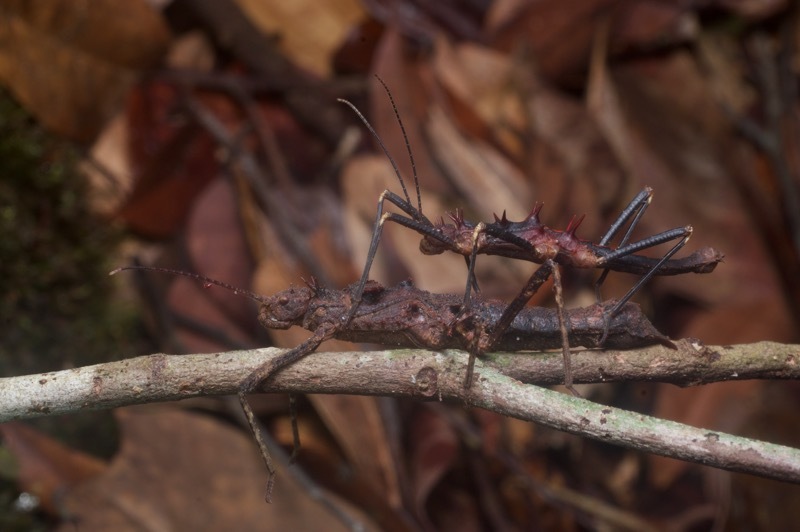 Some of these critters rival the Thorny Devil! I love the Horned Frog and the Angle-headed Lizards are not bad either. 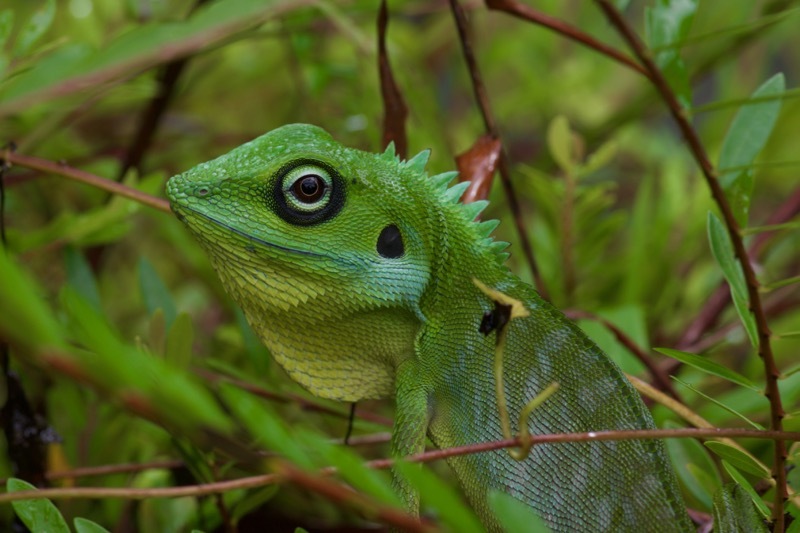 That Green Crested Lizard is a stunner as well. Nice finds and photos. Wow! Your posts are a hard act to follow in general, but sometimes they simply glow. Thanks guys! 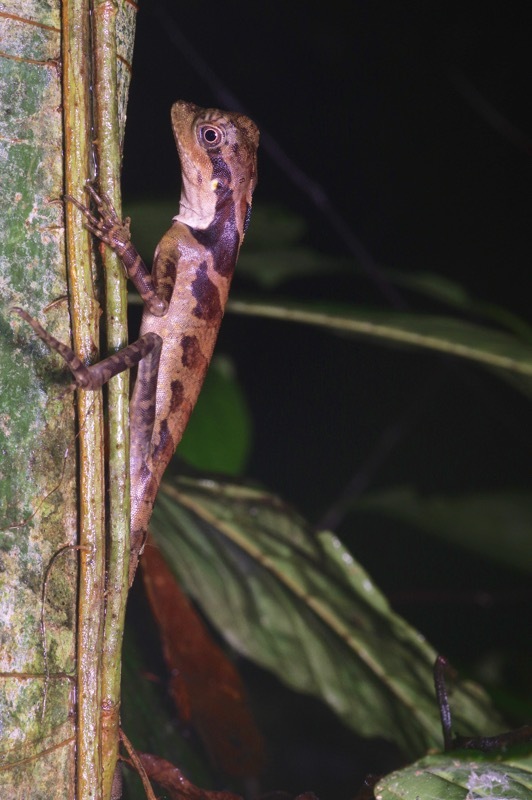 Malaysia is full of amazing herps to be sure. None of them quite rival the amazingness of the Thorny Devil to me, but that's an awfully high bar. What a great thing to look at, the diversity is amazing and I really like the narrative. 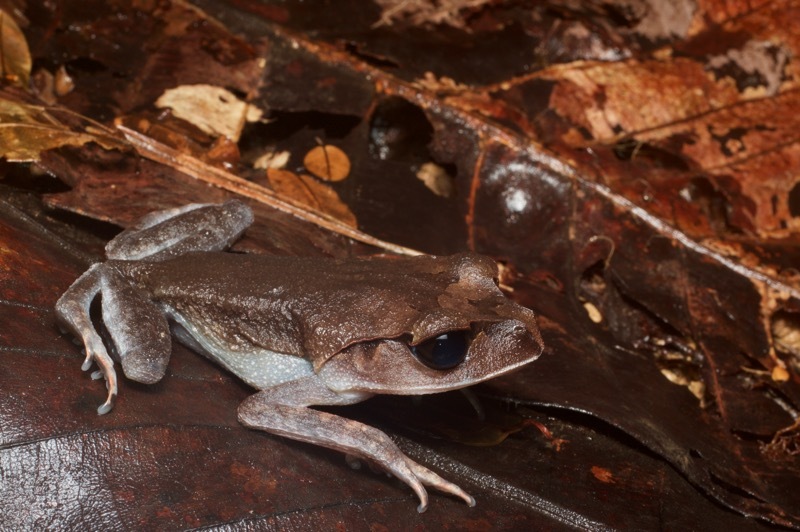 I'm now very interested to know the "tricks of the trade" for finding large leaf-litter frogs like Megophrys. Great stuff, thanks for sharing. Just catching up with your series of posts from your Malaysian trip. The photographs and text are a joy to read. You certainly had some great sightings and experiences that will last a lifetime. Will certainly have some questions for you once I get chance to draw breath. Thanks for taking the time to post these. These were great to read, thanks for sharing! Would love to take a trip to Malaysia sometime. orionmystery wrote: You already knew what happened to my recent trip there! sob sob sob. What's that? Something other herpers should be vigilant for...? Not to worry Jeroen, Kurt only found one lifer species and had been hoping for more. He had bad luck for a change! 1st night - Summit trail up to the frog pond and back - no snake!!! 2nd night - one Xenopeltis unicolor. Didn't even take pic of it. 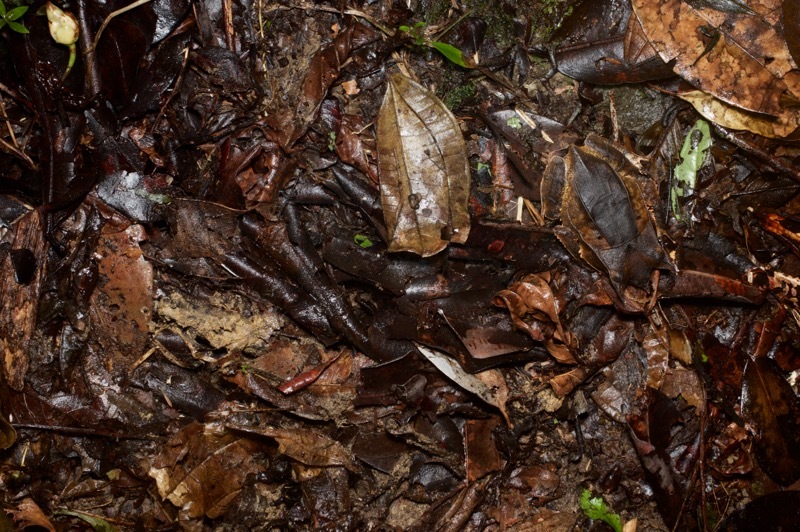 4th night - into the Waterfall Trail, only one Ahaetulla prasina towards the end, and a Lepturophis albofuscus (didn't photograph it) on the way down from Sumiit Trail. No lifer snake. No Gonocephalus doriae. Got a Pulchrana picturata. Thanks VinceAdam2015. 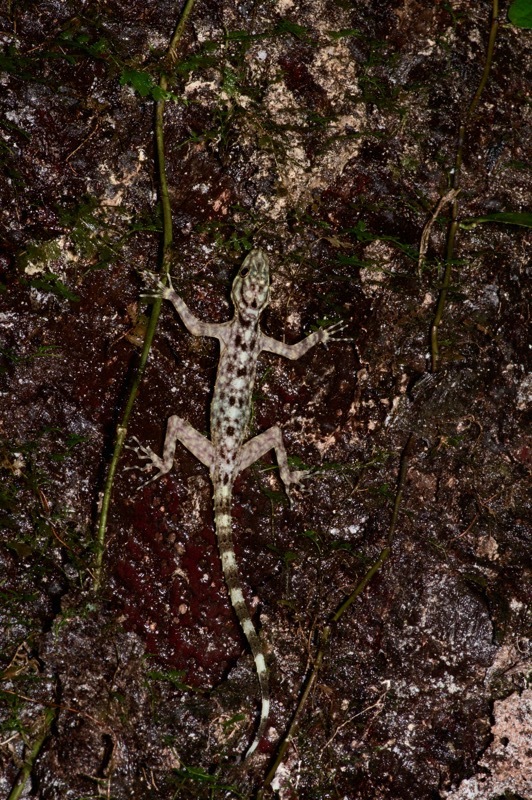 Those were spectacular lizards, especially with the two completely different colors.